Step1: Go to "Clear Recent History"
On a PC, click the "Firefox" menu in the top left corner. 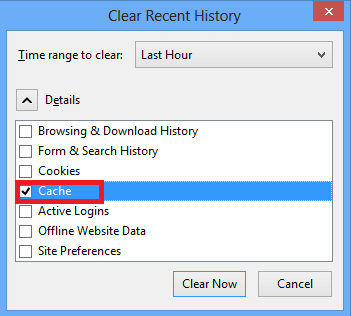 Next, select the right arrow next to "History" >> and click "Clear Recent History"
Or press Ctrl+Shift+Delete to open the recent history window. On a Mac, from the Tools menu, select "Clear Recent History"
Alternately, you can press Shift-Command-Delete. Step2: Make sure "Details" is expanded, then select "Cache" from the list. Uncheck everything else. 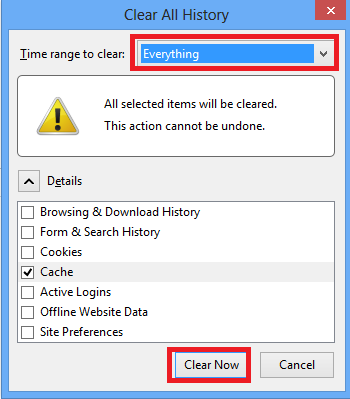 Step3: In the "Time Range to Clear" drop down, select "Everything".